I grab breakfast, lunch and coffee meetings and attend events frequently, but for the most post, I work from home. And believe it or not, I actually sit at my desk for pretty long hours, because a lot of my work involves writing hundreds of emails, proposals and reports for clients, as well as creating content on my blog and other social media platforms. This post is sponsored by Grace & Stella Co.; all opinions are 100% my own. I generally handle stress really well, but recently, I found myself experiencing minor anxiety attacks at times due to an overwhelming amount of work. Don’t get me wrong, I get really excited and am so grateful when I receive new projects to work on. But when too much is happening at the same time, I worry about not being able to deliver the results on time and at the best of my abilities. I spoke to family and close friends about it and most of them remind me to “take a break,” throughout the day. So I listened and would “take a break,” and look at my phone, reply to texts, and check my Instagram — which didn’t help the situation much, to be honest. So I decided to re-think about this “break.” I need something that allows me to feel refreshed, not out of the way (otherwise I won’t be consistent in the future), and most importantly, doesn’t involve my cell phone or my laptop. I’ve always been a big fan of using facial sprays and hydrating mists, and I never realized it’s really one of the best ways for me to feel refreshed. There are so many options in the market right now, but my favorite ones are still anything with rose. 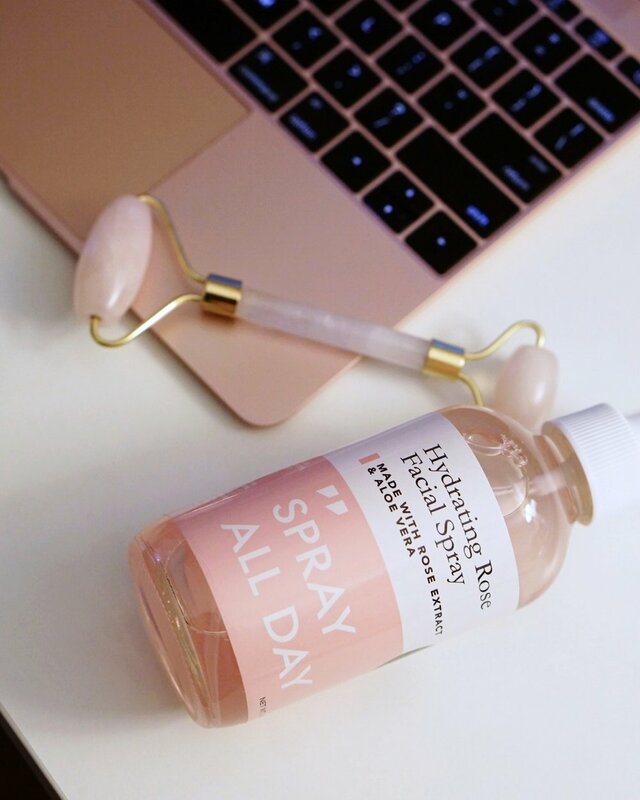 Grace & Stella’s Hydrating Rose Facial Spray, for instance, is currently sitting within arm reach on my desk at all times. I love it because it is made with rose extract and aloe vera, and free of parabens and sulfates. The mist adds moisture to your skin (and I like to mist into the air around me, too) without ruining your makeup. Plus, the spray is on sale now for less than $10! When I mist, I like to also take a few deep breathes. I think the rose scent also helps with calming me down. Another easy way for me to take the attention away from work for a few minutes is to de-stress mentally and physically with a help of a face roller. I have one jade roller, and several rose quartz rollers, simply because I like they are pink. But really, they do about the same thing! Using a facial roller also doesn’t ruin your makeup or distract you too much, but enough to allow you to relax a little. It works much better with face oils, but it is great on its own, too. It gently massages and reduces puffiness on your face, but I think it is the experience of rolling it across my jawline or under my eyes that is really de-stressing. Sometimes I would keep the roller in the refrigerator for an extra cooling effect. It feels great especially when I’m in a dry, heated room. In order to really make sure I stop typing on my laptop or touching my phone, I realized using a hand cream and taking the time to give your hands a nice massage is actually so effective! I thought of this when I was getting a manicure one day, because I was basically “forced” (in a good way) to NOT do anything on my phone. Tea and coffee is great but they both have caffeine and I think avoiding it would be better when you want to “get away” from stress. So my options are hot chocolate or hot water with honey and lemon! I hope you find these simple ways helpful when it comes to taking mini breaks in between work. What are your tips if you have any? Please share them with me by leaving a comment below! Check out my scalp care routine, featuring Natura Brasil’s Hair Tonic. This is how I take care of my skin. Check out some of my tips and tricks!